If someone dies unexpectedly in detention (in prison, immigration services, police custody or under mental health sectioning) there is a legal requirement that the coroner must hold an inquest. An inquest is a public investigation to establish who the person was, and where, when and how they died. If someone dies in the care of the state, then article 2 of the European Convention on Human rights (the right to life) is evoked, and the coroner may decided to hold an article 2 inquest. This is more thorough and far reaching than inquests into deaths that do not engage this duty. For further info, INQUEST have thorough info and excellent caseworkers to provide advice. This all seems fairly straightforward but in practice is a lot murkier and difficult for families to negotiate. Here are some of the issues that we’ve learned over the past year or so. Astonishingly, NHS trusts are able to fund expert legal teams while families can only rarely access exceptional funding to cover their costs. The criteria for exceptional funding is enormously complicated and confusing. The cost of legal representation is not only for attendance at the inquest (and pre-inquest review meetings) but involves a large amount of preparatory work. Our solicitor has read through extensive documentation and records, identified issues to be brought to the attention of the coroner, written submissions, created a witness list and repeatedly requested missing documentation from Southern Health. So far, this has cost around £14,000. Last month a High Court ruling in a case brought by Joanna Letts (who was trying to establish whether her brother’s death was related to hospital failings) says official guidance on whether to provide legal aid has been ‘misleading and inaccurate’. 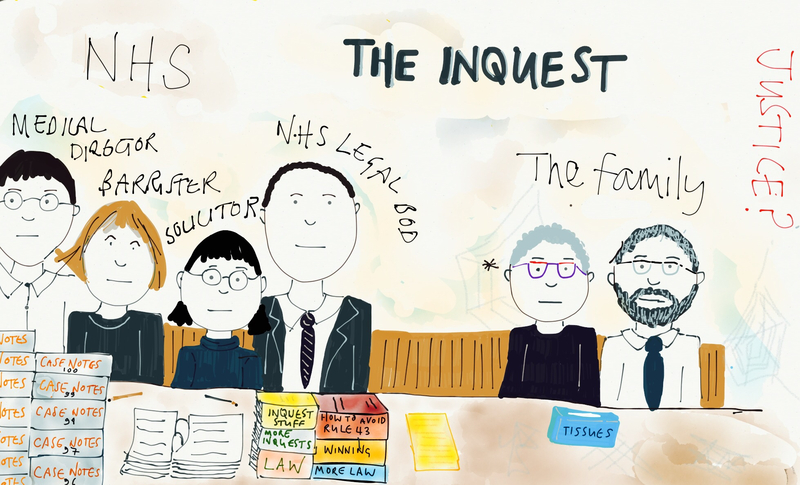 In practice, NHS trusts may be very keen to narrow the focus of inquests to reduce potential damage to reputation and avoid negative findings by the coroner. Sloven had an expert barrister in representing the police and medical defence organisations at the first pre-inquest review meeting. He argued that an article 2 inquest was not necessary because the article 2 procedural obligations were met by the various ongoing investigations relating to LB’s death. He also argued the conditions for having a jury were not met because drowning was not an ‘unnatural’ death. The Minister of State for Justice and Civil Liberties, Simon Hughes, argues that families do not need legal representation at inquests. The coroner should make the process understandable. This is clearly nonsensical given the legal arguments banging back and forth between the Sloven legal team and ours. We also found evidence of inappropriate distortion of the process of preparation for an inquest, with circulation of what we could only describe as ‘model answers’. Central to this was the conflict of roles of one individual who inappropriately combined the functions of senior midwife, maternity risk manager, supervisor of midwives and staff representative. We make no criticism of staff for individual errors, which, for the most part, happen despite their best efforts and are found in all healthcare systems. Where individuals collude in concealing the truth of what has happened, however, their behaviour is inexcusable, as well as unprofessional. 30. A national protocol should be drawn up setting out the duties of all Trusts and their staff in relation to inquests. This should include, but not be limited to, the avoidance of attempts to ‘fend off’ inquests, a mandatory requirement not to coach staff or provide ‘model answers’, the need to avoid collusion between staff on lines to take, and the inappropriateness of relying on coronial processes or expert opinions provided to coroners to substitute for incident investigation. Action: NHS England, the Care Quality Commission. It is explicitly clear that if a family hopes to establish what actually happened to their loved one then a legal team with expertise in getting beyond learned statements is necessary. Yesterday the Public Administration Select Committee of the House of Commons published a report Investigating clinical incidents in the NHS. You can read the JusticeforLB response to it here, while we welcome it’s recommendations, we do not think they go far enough. It is crystal clear that more reform is needed of the inquest system in the UK. The system is archaic and there is no parity of arms. This entry was tagged 107days, activism, advice, campaign, finances inquest, information, INQUEST, inquest charity, inquest coaching, inquest inequalities, inquests, james titcombe, joanna letts, joshua titcombe, Justice for LB, justiceforLB, Kirkup, minister of state for justice and civil liberties, NHS, nhssm, public funding inquests. Bookmark the permalink.